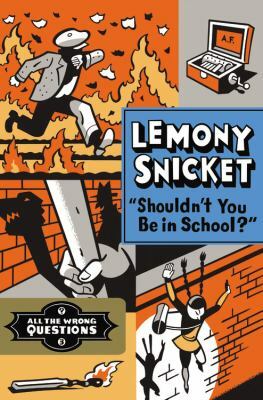 Posted on January 21, 2015	by Katy K.
”Shouldn’t You Be in School?” All the Wrong Questions Book 3. by Lemony Snicket. Art by Seth Little, Brown and Company, 2014. A second Dashiell appears in this book (see Space Case for my first Dashiell of 2014), a librarian friend of our narrator, a pre-teen Lemony Snicket. I haven’t read the first two books in the series, but that didn’t really cause any difficulties. This is noir for the tween set, as Lemony and his fellow friends, mostly all twelve-year-olds with jobs, try to figure out what the right questions are to solve mysteries. The friends include Moxie the reporter, Jake the cook, Cleo the chemist, and the mysterious femme fatale Ellington Feint. Mysteries include many burned buildings, an extremely aggressive truancy department, and a library full of blank books. I was especially interested to try this because I’d tried the Series of Unfortunate Events at a particularly sad time in life, where I wasn’t in any place to appreciate the humor of orphans trying to escape ill-meaning relatives. This series still pits children against adults in a way that’s likely to disturb adults and satisfy kids, but at least here not all the adults were deliberately malevolent. It still has the trademark snarky humor combined with a deep and genuine love of vocabulary and books. The young Lemony frequently summarizes books which well-read children ought to recognize, in re-telling them to himself or friends in times stress – a shared delight for book lovers. I’m not sure I’ll seek out the other books myself, but I’d definitely recommend it especially to kids who like dark humor and tales of self-reliant, book-loving kids. This entry was posted in Books and tagged Mystery, noir, youth fantasy. Bookmark the permalink.